The First 'Honest' Spam in the Irish Language? 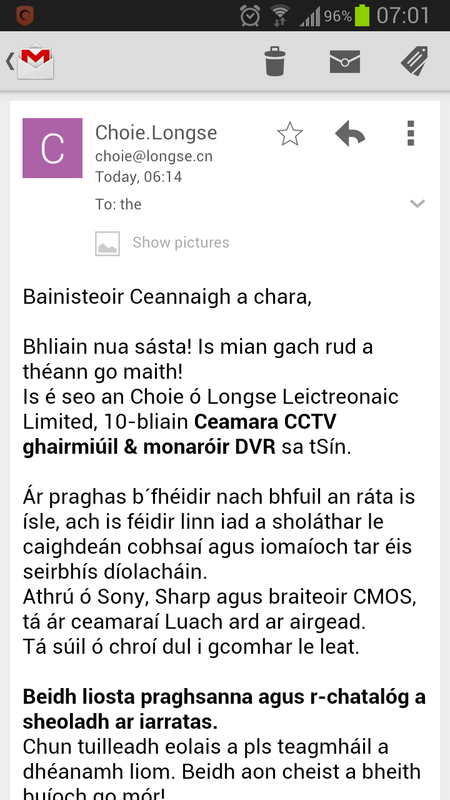 So, it may well be the first piece of “honest” spam as Gaeilge! The email received by Piers Dillon Scott this morning is – probably thanks to Google Translate – certainly intelligible to an Irish speaker. Of course it reads about as easily as Chinglish, but you get the message. We’ve seen a steady improvement in Google Translate‘s handling of Irish over the last few years. It’s likely that Irish has benefited relative to other minority languages, from the fact that Google’s EU HQ is located in Dublin. Machine translation of human languages is improving rapidly and it will have profound consequences for our global Internet. I’m currently volunteering on a web design project for an Irish secondary school with over forty different nationalities on the roll, and dozens of different “home languages”. The Google Translate widget will feature on every page. We know it’s not perfect, and parents must continue to rely on the help of their English speaking children. But it’s a small step towards understanding and engagement in a multilingual world.